What better way to use your outdoor space then to entertain! Having a successful party doesn’t require much, just good company, good food, good drinks, and a comfy, functional, decorated outdoor space! Set up a place to keep the essentials like outdoor plates, cups, bowls, napkins, silverware, and candles. Use table cloths that are easy to clean that you can use over and over again. Decorate with flowers you’ve cut from your own yard. Use different size glasses or jars to create a one of a kind centerpiece! Ask guests to bring their favorite music. Have a large trash can ready to have clean-up happening during the party. If someone offers to help or bring something, ALWAYS say yes! A fresh mow goes a long way in making your yard look fantastic. Make sure to pull up the weeds and clean up any toys or other debris. Have a fan nearby to keep your guests cool. A running fan will also help to keep mosquitos and other outdoor pests at bay. Have comfy seating like barstools or lounge chairs so your guests will enjoy their time at the table even more. If you have a pool, have sunblock ready for guest to use, as well as towels. Have a variety of snacks available like veggies, crackers, and fruit. Get the grill ready ahead of time so you’re not wasting partying time cleaning it! Choosing a theme could make the entire gathering easier, especially if guests know what it is. Typically guests will bring something with them and if they know what the theme is, they can make wiser (and more fun) choices. If you run out of seating, spread blankets on the grass. You can also use those footstools so guests have a place to set down their drink or plate of food. Instead of putting out bottles of ketchup and mustard etc., squeeze some into small dishes for easier use by your guests. If there will be little ones at your gathering, have crayons and paper available to keep them occupied. Break out the yard games that are collecting dust in your shed! They aren’t just fun for the kids! Use heavy duty paper plates that can be thrown away to save time on cleanup. You can even splurge on the colorful ones to add a bit more “fancy” to your party! 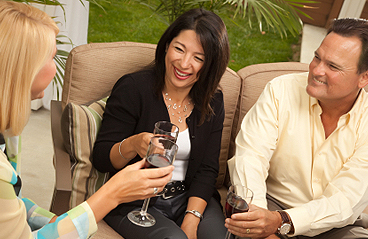 The most important tip we have for you to keep your guests coming back to your parties is to make sure everyone is able to relax, including you, the host! Please contact us with any questions and feel free to browse the rest of our site for a wide variety of unique barstools.